The Utopie group was born in 1966 at Henri Lefebvre’s house in the Pyrenees. The eponymous journal edited by Hubert Tonka brought together sociologists Jean Baudrillard, René Lourau, and Catherine Cot, architects Jean Aubert, Jean-Paul Jungmann, Antoine Stinco, and landscape architect Isabelle Auricoste. Over the next decade, both in theory and in practice, the group articulated a radical ultra-leftist critique of architecture, urbanism, and everyday life. 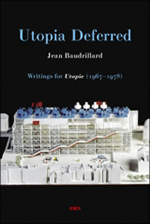 Utopia Deferred collects all of the essays Jean Baudrillard published in Utopie as well as recent interviews with Jean Baudrillard and Hubert Tonka. Utopie served as a workshop for Baudrillard’s thought. Many of the essays he first published in Utopie were seminal for some of his most shockingly original books: For a Critique of the Political Economy of the Sign, The Mirror of Production, Simulations, Symbolic Exchange and Death, and In the Shadow of the Silent Majorities. But Utopie was also a topical journal and a political one; the topics of these essays are often torn from the headlines of the tumultuous decade following the uprisings of May 1968.